I stand corrected. It wasn’t a rice paddy. It was fields of onions. It was just a sea of green until I got up close to take a photo, ok!?!? Whatever it was, it was beautiful. I went back to try and take some photographs but couldn’t capture it sufficiently as my previous post (now updated with pictures) will demonstrate. 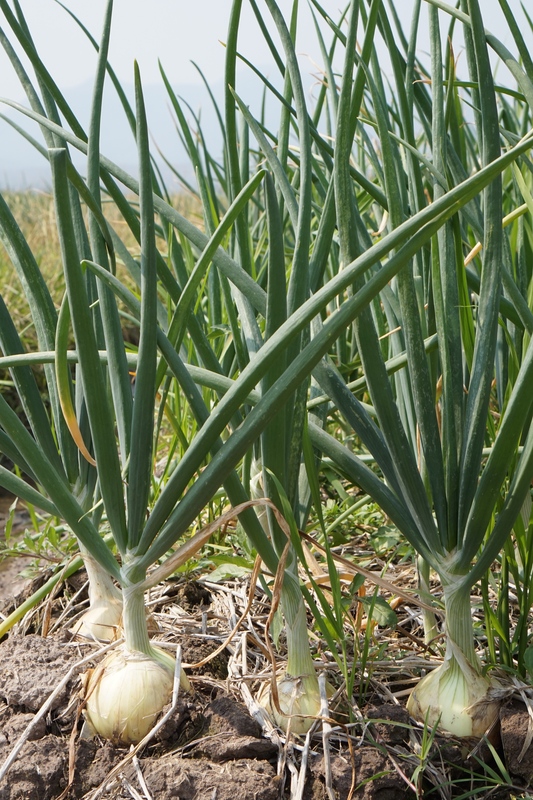 But here’s the onions…. I forgot to mention in my last post that whilst I may have felt like an idiot with my Borgen reference, at least I wasn’t the (english, sadly) member of my group in the first elephant park to ask, out loud, if the male elephants can have babies, too. And he meant it. Even his girlfriend turned round and said “please tell me you didn’t just ask that”. So at least my comment wasn’t completely off the scale like this was. Anyway, I didn’t cry when I flew out of Thailand, but I did feel very sad to leave. As I lay in my bed on the last night, watching the light from my thatched roof cast eerie shadows over my mosquito net (which kept out the mozzies, but not the ants), listening to the cacophony of sound outside ranging from a frogs chorus (now I know what one sounds like, and it is very loud! ), to the running water in the river, elephants eating, trumpeting, roosters crowing, I had to keep reminding myself to remain in the moment and soak every last second up. Something amazing happened to me in Chiang Mai. My back, as you may recall, was extremely painful. At it’s worst, I couldn’t sit down, propel myself upwards, or walk very well. Back home I would have been utterly reliant on Katie, my miracle worker cranial sacral therapist to fix me, but all I could do from Thailand was text her and get her view on the damage. After a lot of searching and begging, I found Cory, an alternative practitioner in Chiang Mai who was prepared to see me, as long as I didn’t mind her students being present as she was in the middle of running an Asian Bio Energy Therapy course (stay with me here). The first thing she did was test my energy levels (like I said, stay with me!). I had to sit, forefinger and thumb gripped together as she tested my resistance depending on different acupressure points that I was touching. I was very strong except for my back, where I couldn’t hold my fingers closed, or my stomach (I had been ill the whole night). And then she took my watch off, and put it back on. No resistance. “That’s a very nice watch Sharon, but your body doesn’t want you to wear it”. And the same with my mobile phone. And my flip flops (who would have thought little old me had sensitive feet, but apparently I shouldn’t be exposing them to cold floors!). And then she treated me, by holding a heated herb mixture, Moxa, to my back and my stomach. Once I got over the embarrassment of her pulling down my trousers to reveal a rather shabby g-string (oh, the shame), I lay there and truly felt things move in my back and the energy return to my body. (Please stay with me!!). Its hard to describe, but I went back to the lodge feeling so much better, both physically and emotionally, although the taxi driver was less impressed, told me I smelt (of herbs) and opened the windows. The people running the lodge said I seemed really different, as well. I returned the next day for a second treatment, which was just as energising. (I put on big pants this time, proud of planning ahead, but then realised as I rushed to get in the taxi again that they had a big hole in them…. I cannot wait to stop using the laundries out here!!). The same taxi driver told me I smelt again but that he quite liked it in fact. And then I woke up on my last day, with no pain in my back and feeling… brilliant. 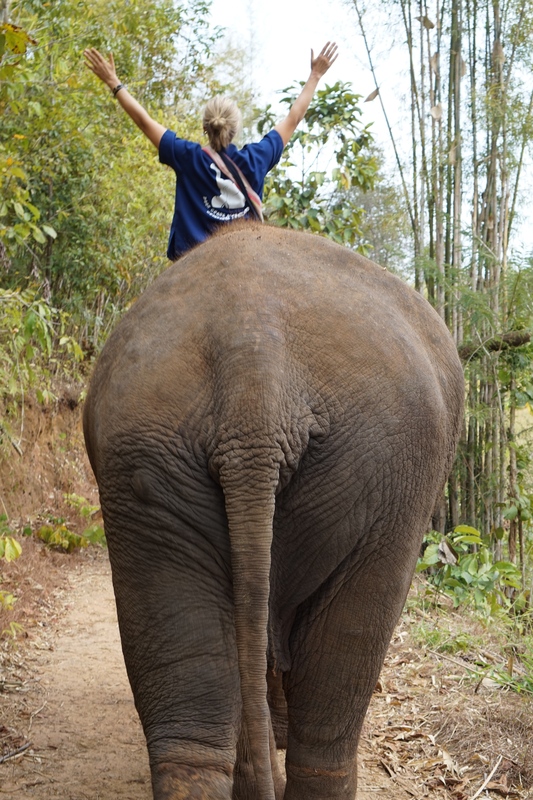 So, like I said, something amazing happened to me in Chiang Mai. I think I have found what I was looking for. I feel energised, relaxed, so so happy, excited… the only way I can think to describe it is that I feel like I have found my peace. I almost want to go back through Indochina and start it all over again in this frame of mind. 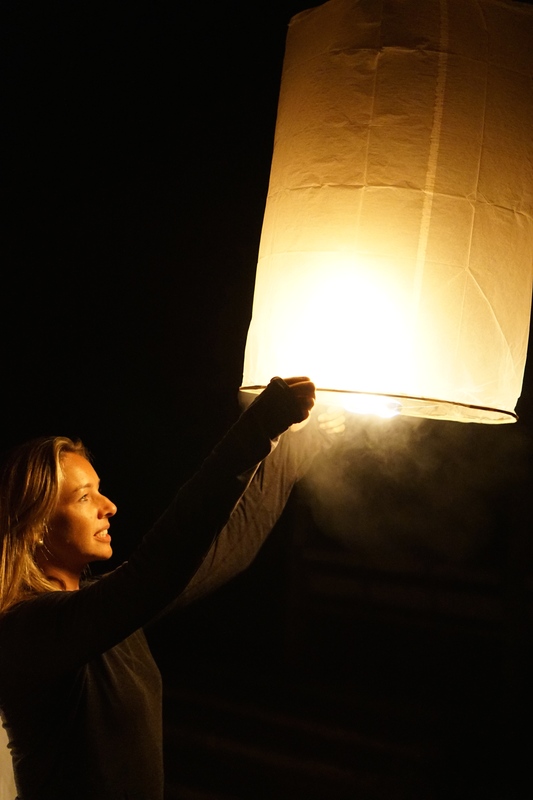 I don’t know if it was the treatment, the elephants, seeing old friends, chilling out, the wish I made as I launched my lantern in the elephant park, or all of the above but I feel like a completely different person. And those of you who know the hippy in me will know that when I get home I will be working on that energy….